Rolling out the red carpet. The 5-word phrase undoubtedly conjures up images of dignitaries, movie stars, returning heroes and other distinguished guests receiving best-in-class, deferential treatment. And this year from November 3-11, 2018 — and for the next 5 years — that phrase will also aptly apply when speaking of pickleball, Indian Wells Tennis Garden and USAPA’s marquee event of the year — the National Pickleball Championships. On February 1, 2018, the USAPA and Indian Wells Tennis Garden signed a 5-year deal to host the USAPA National Pickleball Championships exclusively at their facility in Indian Wells, CA — just outside of Palm Springs (78-200 Miles Ave, Indian Wells, CA 92210). The venue — featuring the second largest tennis stadium in the world, as well as 28 world-class tennis courts — currently hosts the BNP Paribas Open – the largest combined men and women’s tennis tournament in the world. This has potential. Lot’s of potential. The atmosphere for the event will be second-to-none — world-class pickleball, live music every afternoon, several food and drink options and much more. 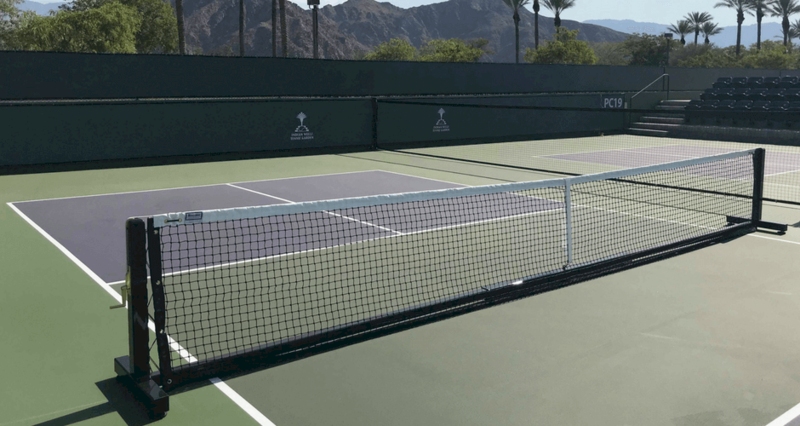 The team — led by Fred Hartman, Club Director at Indian Wells Tennis Center — is already busy getting the venue ready for its showcase event scheduled for November 3-11, 2018. Converting Existing Tennis Courts into, Count ’em, 45 Pickleball Courts! 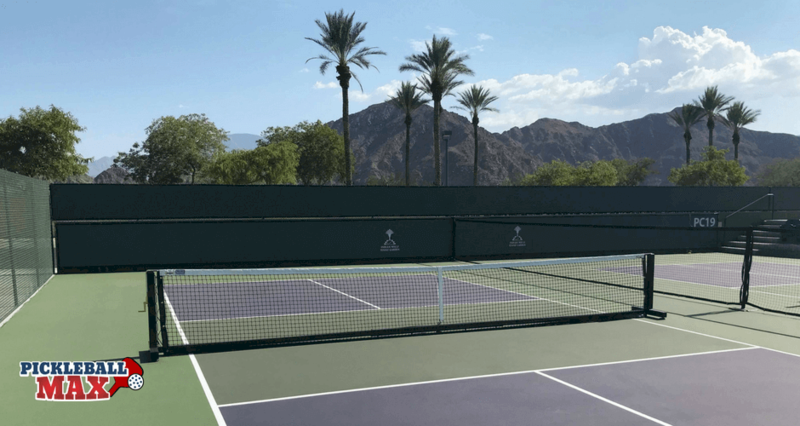 To provide the best-in-class experience for the pickleball players during Nationals, Indian Wells Tennis Garden is converting existing tennis courts and painting them into pickleball courts. At the conclusion of the event, the courts will once again be converted and painted back to tennis courts. In total, there will be 45 pickleball courts (painted specifically for pickleball) — all of which will have heavy-duty, semi-permanent nets (see image below). The nets are temporary nets that “look and, more importantly, play like permanent nets.” The venue will also feature an elegant court-divider system that has been custom-designed specifically for Nationals (see image below). There are several lodging and accommodation options available for players and spectators — including local hotels and RV resorts. Sky Valley Resort, located in the Coachella Valley near Indian Wells, Palm Springs and Palm Desert, CA, is one such option. The resort has two beautiful clubhouses featuring natural hot mineral pools and spas. The focus on health and holistic living in community makes Sky Valley a special place. And they play pickleball! 🙂 What a perfect option during your stay at Nationals. Click here for more information about Sky Valley’s RV Resort or vacation rentals. For those of you playing, reffing and spectating — enjoy your week at Nationals. It will be a blast. I will be living vicariously through you during the week watching the live feeds on Facebook. It’s the second best thing to being there. See you on the courts! does anyone know what brand of nets was used at Nationals. they are great! As I understand it, the DOUGLAS PREMIER 22′ PORTABLE 8 & UNDER QUICKSTART NET POST SYSTEM was adapted to “meet the needs for Nationals.” Hope that helps!